Los Angeles Police Department Detective Davie Richards picks up a cold case involving a woman who apparently walked into Black Jack Guns & Ammo on Venice Boulevard, managed to open a display case, and shot herself with a Smith and Wesson revolver. The general consensus was suicide, but the coroner hedged at the time because there was no gunshot residue on the victim’s hands, no note, no witnesses, and no evidence the woman was depressed or having trouble. The further Davie probes, the more convinced she becomes that the woman was a victim of homicide and that everyone around the case is lying about something. She soon discovers that the victim was living under an assumed name and that very dangerous people hold a stake in the outcome of Davie’s investigation. 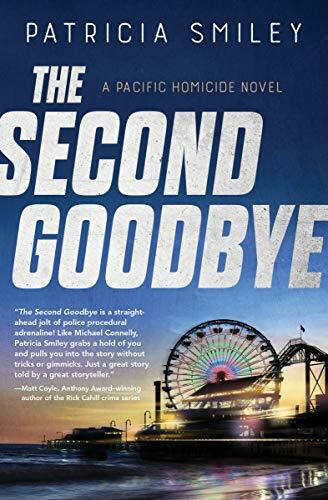 The Second Goodbye is the third novel in Patricia Smiley’s Los Angeles-based Pacific Homicide series, following Pacific Homicide (2016) and Outside the Wire (2017). Before launching this series, she produced a four-novel mystery series featuring amateur sleuth Tucker Sinclair, also set in L.A.
Moving from a character outside of law enforcement to one inside the LAPD, Smiley has shifted from humorous romantic suspense to police procedurals. She does a fairly good job creating a sense of verisimilitude by spending time on elements ranging from the specific forms Davie must complete at various stages of her investigations to the very special mindset of law enforcement professionals. Smiley has a few lapses here and there, though, such as Davie’s periodic failure to identify herself as a police officer and a tendency to interview important witnesses in public places such as coffee shops with nosy bystanders listening in, something her amateur sleuth would be more likely to do. Nonetheless, over the course of the novel the author does a commendable job moving us around inside the LAPD’s Pacific Division as we follow Davie’s work. Another holdover from her previous series is the element of romance that tracks throughout The Second Goodbye. Davie is stuck on fellow LAPD Detective Jon Striker, who works out of the Homicide Special Section of the elite Robbery Homicide Division of the LAPD. They worked together on a previous case, and while Davie is typically sensitive about encroachment onto her investigative turf, Striker is a hunky chunk of masculinity who affects Davis’ focus rather significantly when she teams up with him on the suicide case. However, no one passed a rule that police procedurals have to be uniformly hard-boiled and serious minded, and even Michael Connelly has explored Harry Bosch’s love life in various novels. Readers may therefore decide for themselves whether or not they want to sign up for a professional relationship that veers off into infatuation, messy self-doubt, and encounters in exotic places such as the British Virgin Islands. As for Smiley’s writing style, her tone in the first 50 pages or so is note perfect. However, as the novel progresses the narrator gets a bit too slangy, dropping stuff like “break leather,” “bag Zs,” “peeps,” and “tighty-whities.” It tends to come off more like a parent trying to impress their kids with their grasp of the vernacular than a tightly-controlled narrative voice typical of the best procedurals (see Connelly, above). As well, her switches in point of view to the assassin responsible for most of the mayhem in the novel, a strange specimen with mushroom-shaped ears, also make a questionable contribution to the story. Some readers like to check in on the bad guy to study his badness and monitor his progress, and so Smiley accommodates that predilection. One just wishes there’d been some resolution to the final fate of the guy’s cat. Poor Gizmo. Whatever became of you? These criticisms having been logged and filed, however, The Second Goodbye remains a very good procedural that reads quickly and will hold the reader’s interest. Davie Richards is a likeable protagonist, germaphobia and all, and the story moves at a good pace. Bad novels tend to get put aside before the end, but you’ll find that you’ve finished The Second Goodbye before you know it, and you’ll be looking for another one from Patricia Smiley to continue the entertainment.